Rediffmail, a web-based email service provided by Rediff.com is one of the most widely used email services even today. 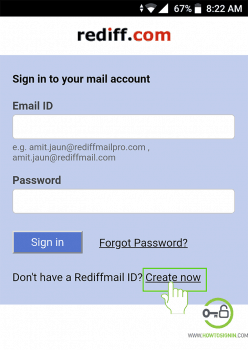 With the improvement of its interface and launching of mobile application Rediffmail has started regaining its long-lost popularity. 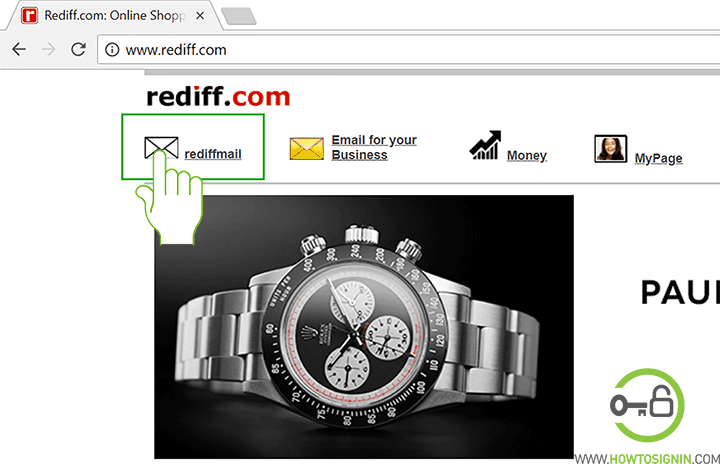 In this article, we will discuss how to create Rediff Mail account using internet browser as well as a mobile app. 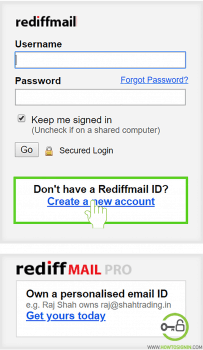 Navigate to rediffmail.com from any web browser you prefer. 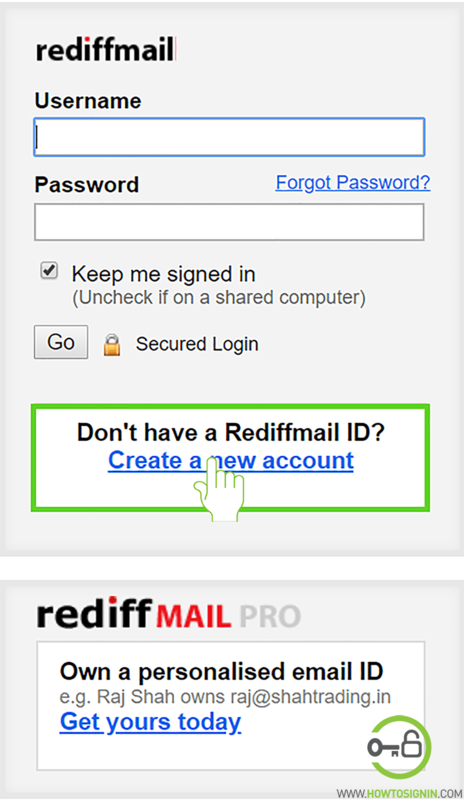 Click Create a Rediffmail account option towards the top right corner of the page. 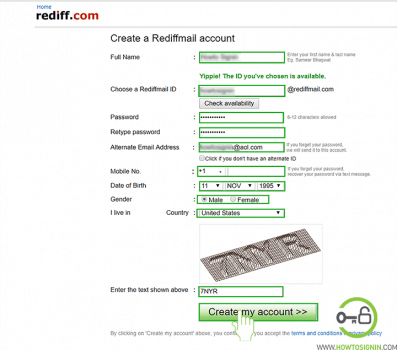 Enter the username that you want to keep as Rediffmail id and click on availability. If the ID is already taken, you need to choose a new one. Insert a password that is of 6 to 12 characters. Use the combination of uppercase & lowercase alphabets, numbers, and symbols to create a password that is easy for you to recall but difficult for others to guess. Retype the password to confirm it. Though you can copy the password you have entered and then paste the same to confirm the password instead of retyping it, we recommend you to re-type it manually so that you will be sure about what you have kept your password. 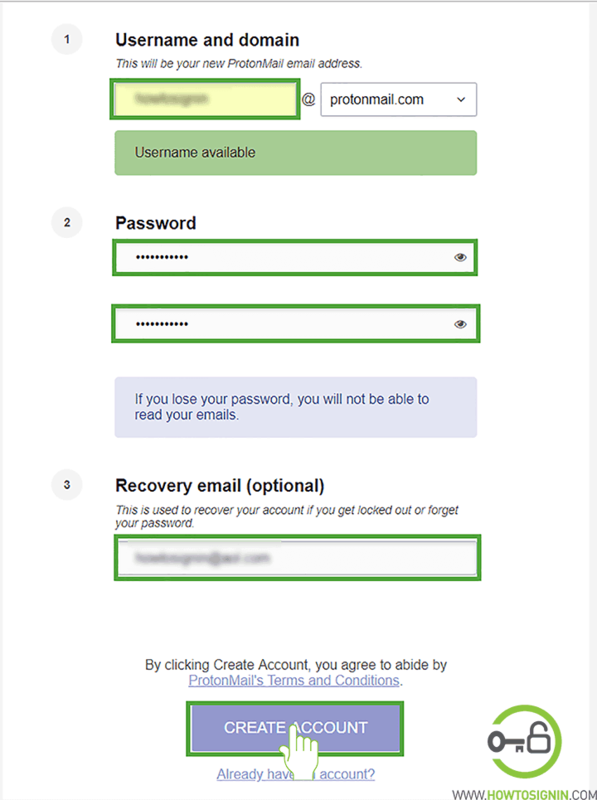 Now, enter your existing email address you can use to recover the password in case you forget it. In case you don’t have an alternative email address or if you don’t prefer to keep any email address as alternative then click the small box just below the alternative email address box. If you don’t enter the alternative email address you will be asked to select a security question and enter an answer to it that will be used to recover the password in case, you forget it. Mobile number: Insert your mobile number along with the country code that you can see in the drop-down list as you click the box to enter the country code. 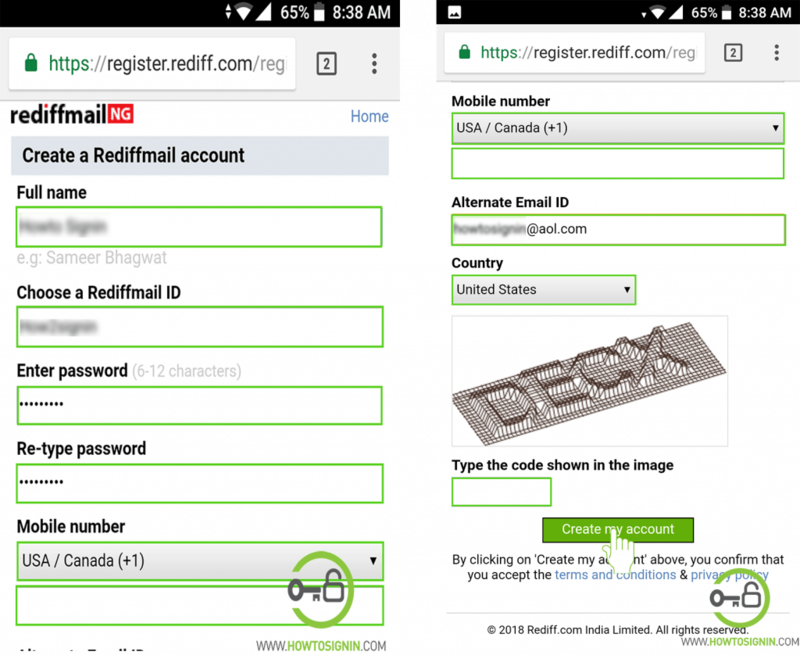 You cannot insert the mobile number that has already been associated with another Rediffmail account. Provide your date of birth from the drop-down list. Choose the country you live in. If you choose India, you must enter the name of the city you live in as well. When you enter all the required information click on “Create my account”. You will now receive an OTP (verification code) in the mobile number you have entered; enter the code in the box and then click on verify. Rediffmail will ask for your additional information about education and occupation. Further, you need to decide whether you want daily news in your inbox or not. However, you can choose not to answer any of them and click on “Go to Inbox”. Finally, your Rediffmail registration is complete. Go to the menu of your smartphone and open RediffMail app. You can get a mobile application from Play Store for Android device and Apple Store for iOS devices. 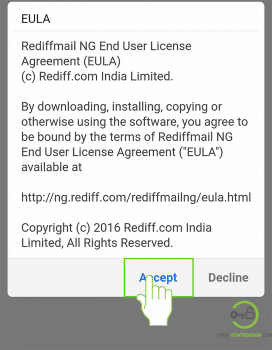 As soon as you open the application you have to accept the terms and conditions of Rediffmail NG; tap on Accept to continue. Choose Rediffmail ID that you want as your email. Select the country code and then enter the mobile number. Select the country you live in. Generally, it is automatically selected once you select the country code. Type the code shown in the image and then click on “Create my account” option. Verify the mobile number by entering the code sent to the mobile number you provided. 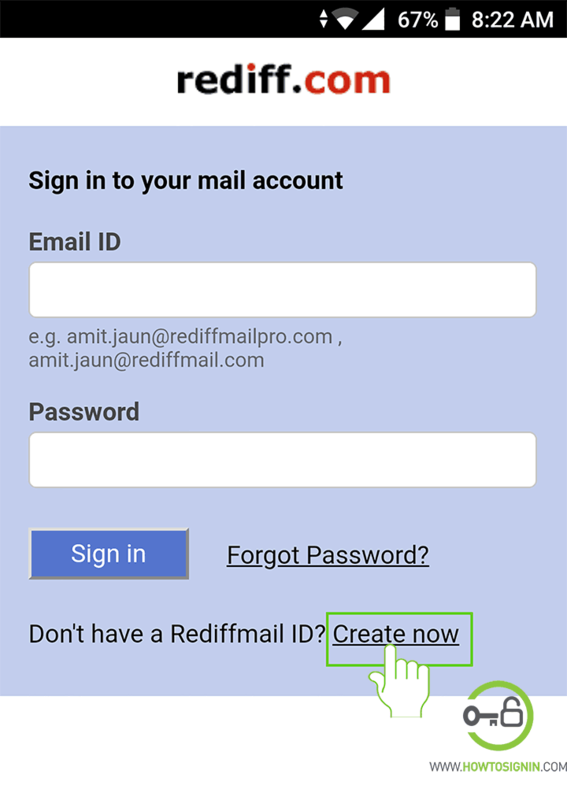 Finally, your Rediffmail mobile application is all set and you can send or receive emails in your mobile device now.